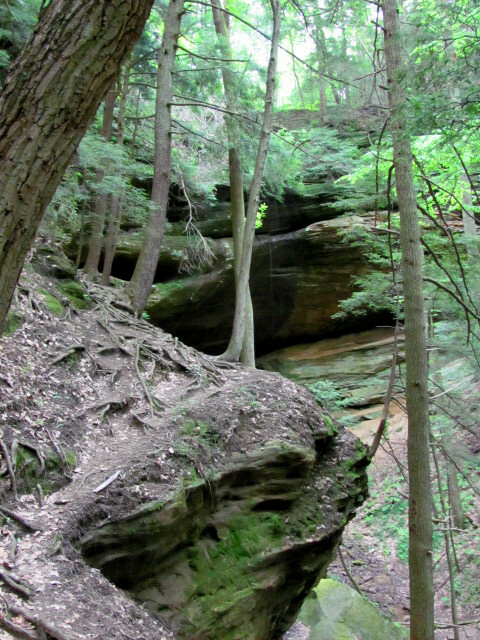 The last area of the Hocking Hills adventure was to the Cantwell Cliffs. As stated I love exploring around rocky outcrops and this site didn’t disappoint me. found. One needs to work through two huge rocks known as the “Fat Woman’s Squeeze”. 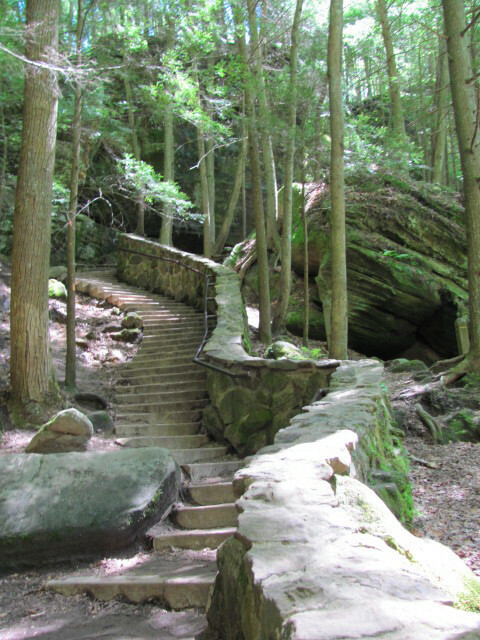 Hand hewn rock steps flow through these rocks. Many other man-made steps are located at various places to aid in walking. The large trees were quite impressive as well. 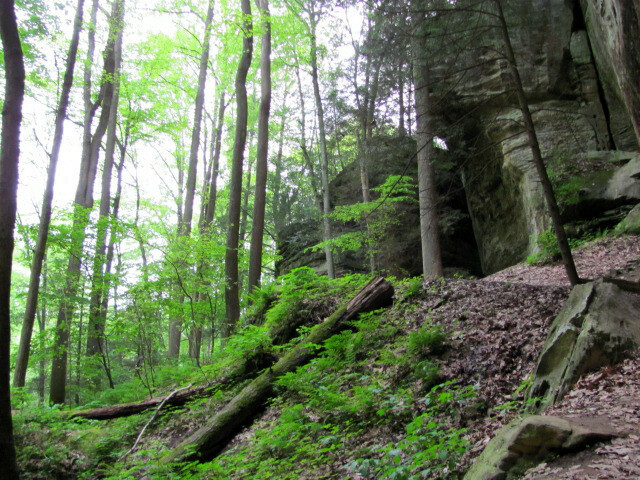 We later worked another trail, that for the most part, flowed the cliffs upper rim. 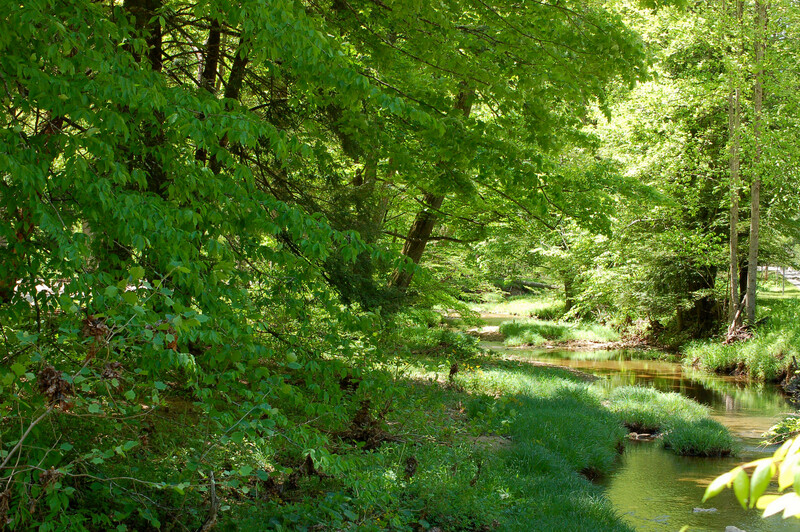 The hollow features a small stream known as Buck Run. As we walked these trails the skies darkened and a light rain began to fall. Threats of severe weather forced a decision to abandon the hikes for another time. 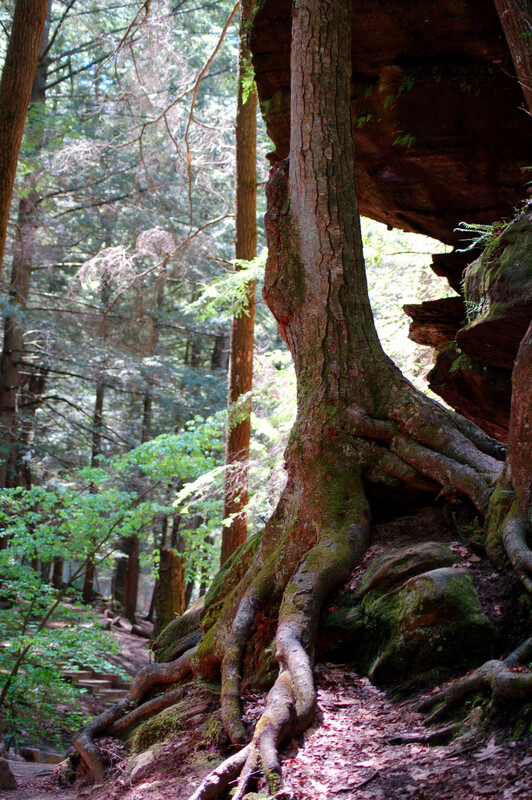 While visiting this Hocking Hills, Ohio area, we checked out the famous site known as Old Man’s Cave. (We actually went here twice over our visit.) 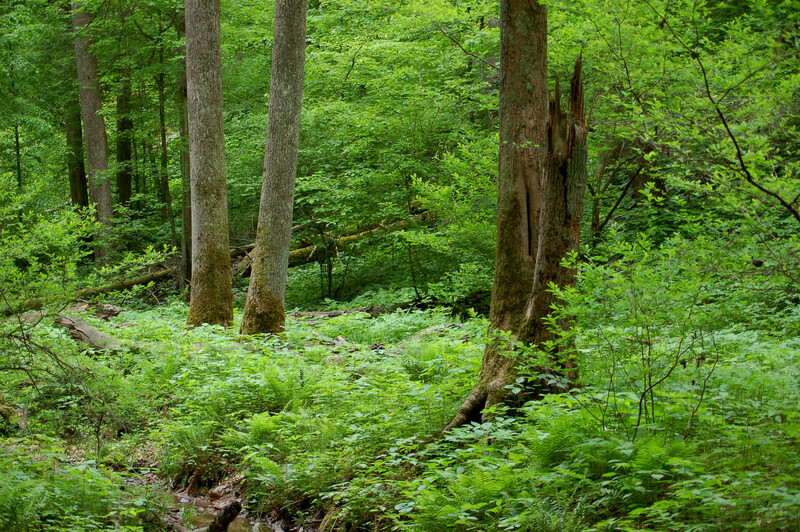 This is a most interesting place to walk around and enjoy nature’s beauty. 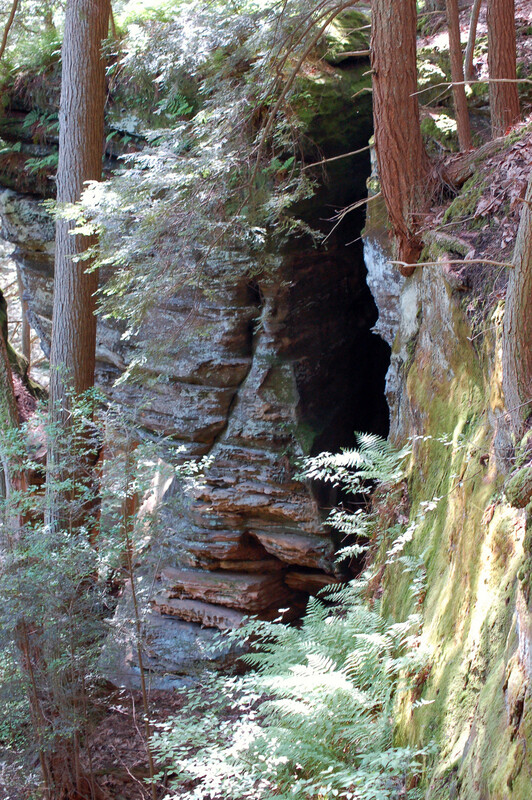 A hermit named Richard Rowe lived in the large recess cave of this gorge. 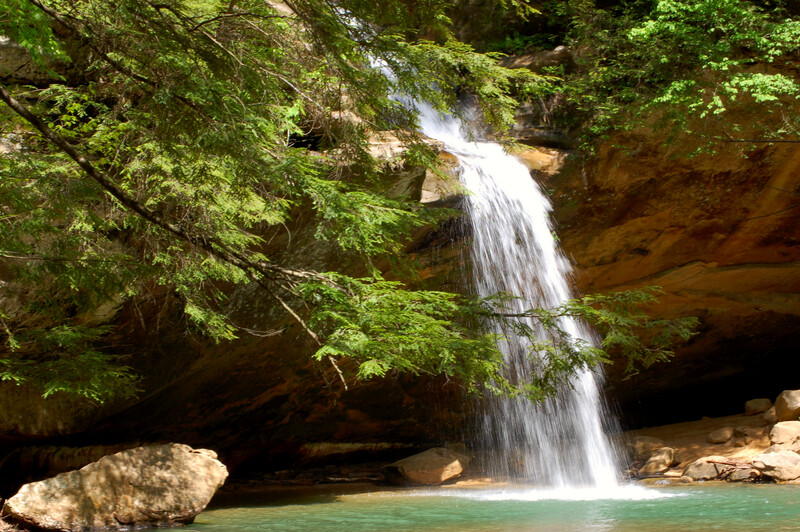 The man’s family moved to this area of Ohio in 1796 from the Cumberland mountains of Tennessee. 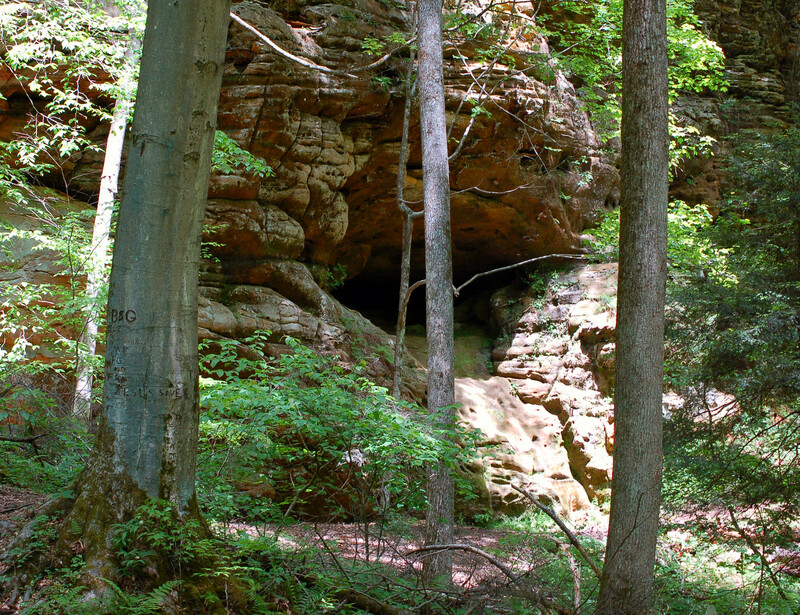 Rowe lived the remaining years of his life here and is believed to have been buried beneath the cave’s ledge. Nathaniel and Pat Rayon, also, moved to this area in 1795. They built a cabin north of the cave. They, too, are buried in or near the cave. 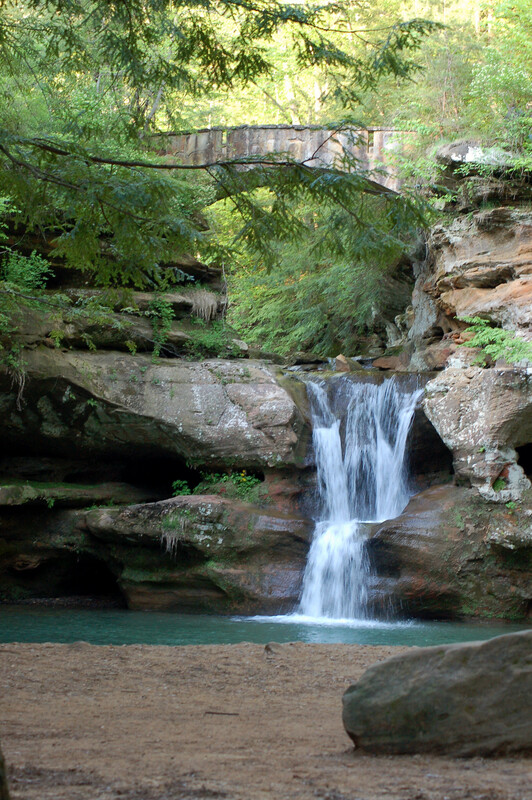 The Old Man’s Cave area consists of an upper and lower gorge with three distinct waterfalls flowing through the hollow. 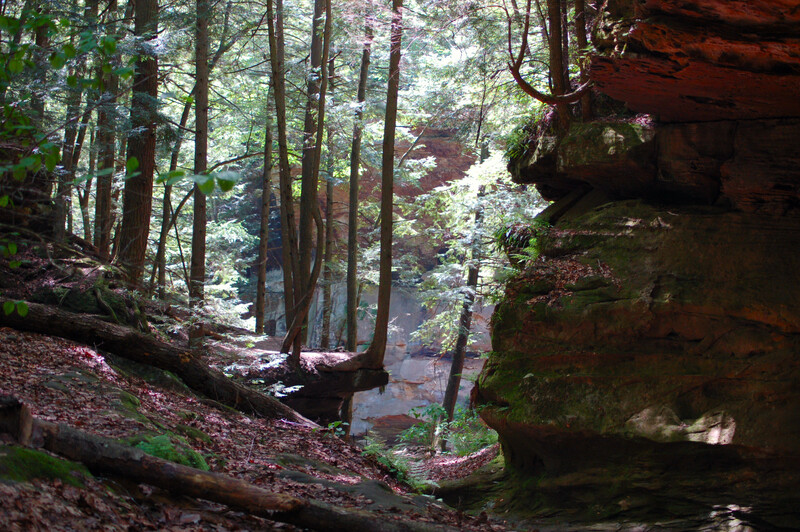 The entire gorge cuts through 150 feet thick sandstone. The gorge is about half a mile long. 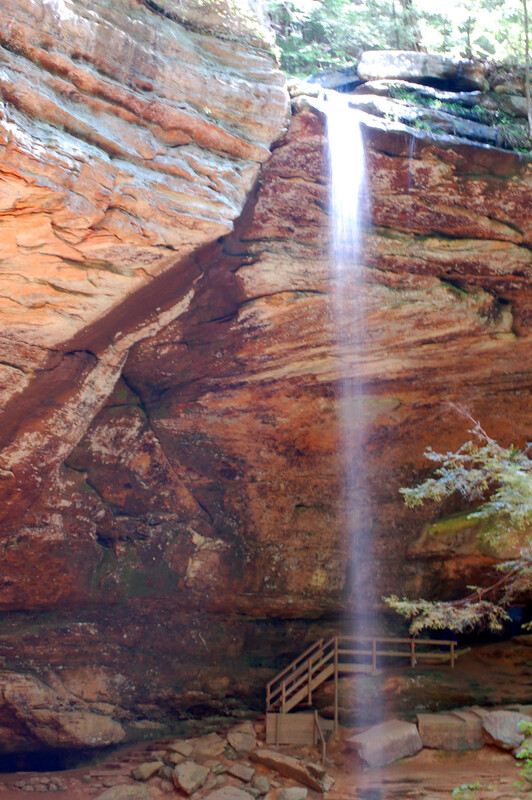 The actual cave area is about 200 feet in length and fifty feet high with a depth of seventy-five feet. 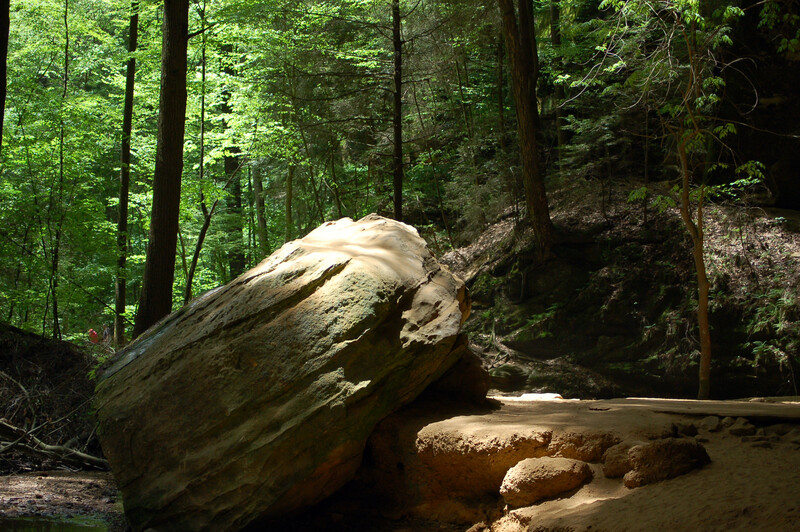 As a boy I would crawl into and around rocky outcrops along the Crooked Creek watershed areas near Cochran’s Mill and Rearick’s Ford of Pennsylvania. 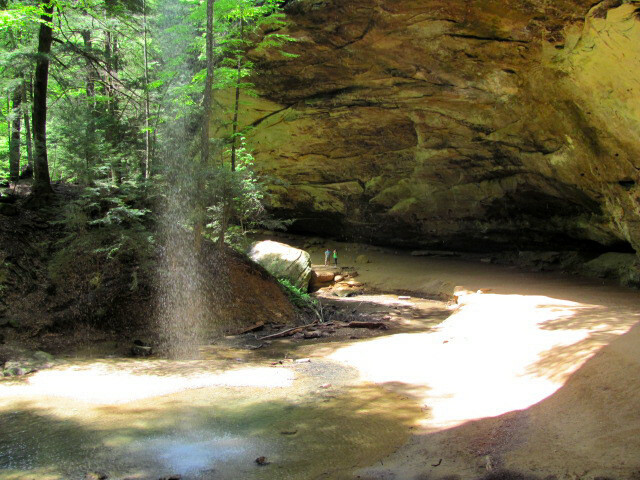 I have always loved exploring such places so you might guess I was childlike during these excursions here at Old Man’s Cave. Laurie and I went to visit Cedar Falls and we noticed a couple of females of the Oriental race. The youngest approached us with a deeply concerned look on her face. they were bewildered. 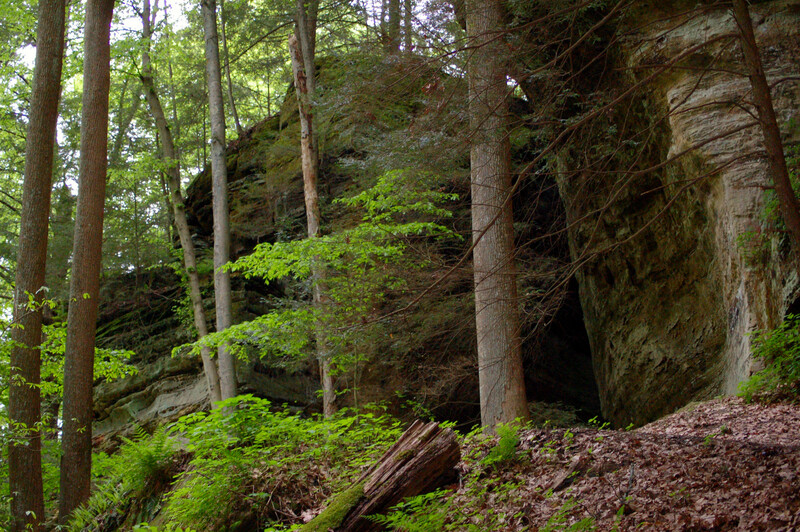 They had walked a two-mile trail from this cave area believing the trail would circle back. It ended at Cedar Falls. 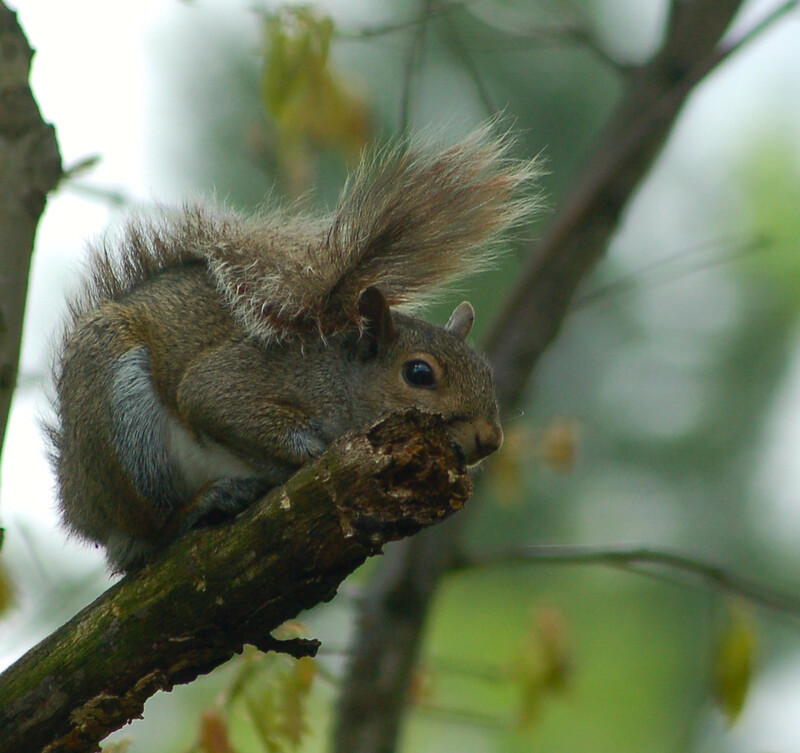 I pointed to the trail’s end for their return, but finally they admitted they were tired. We gave them a lift back to their car at the cave’s site. 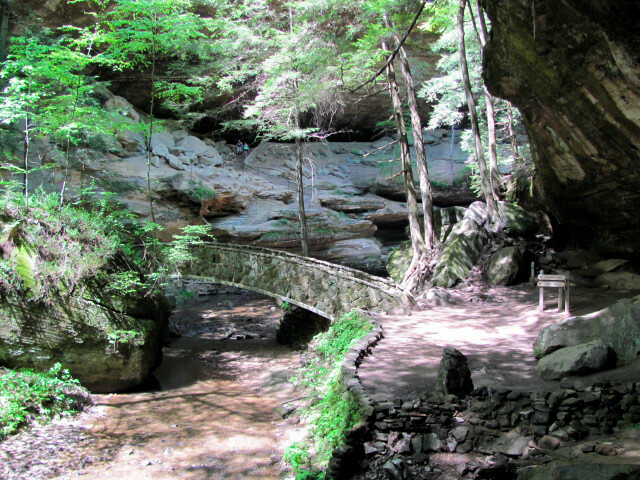 Another man-made items to see at the Old man’s Cave are the stone bridges; stone fences, hewn tunnels into the rocks and hewn stone steps. 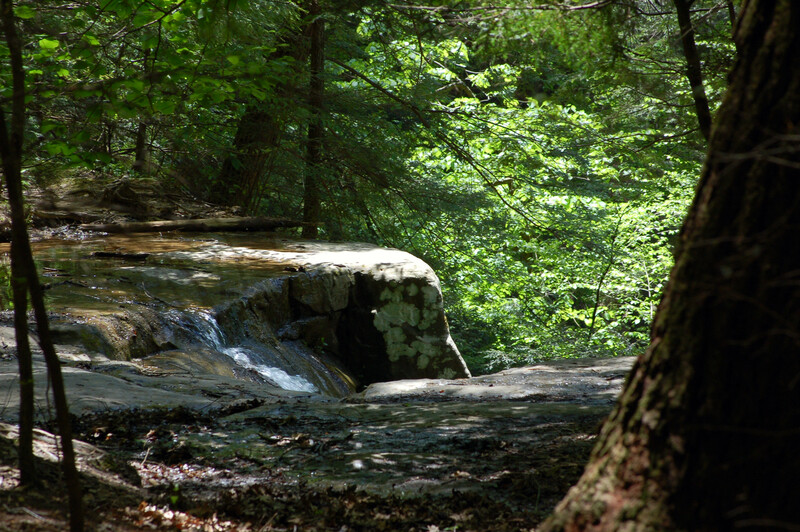 These features fit nicely with the natural beauty of the area. 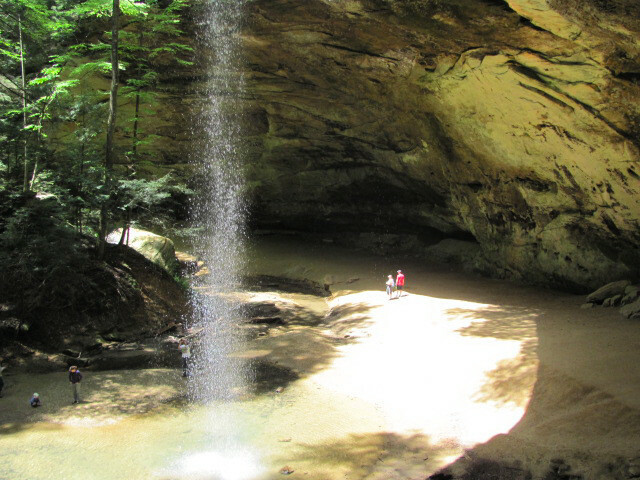 Laurie and I visited a unique site of the Hocking Hills experience. The site is known as the Rock House. The huge rocky outcrops common to this area didn’t fail us with this view either. This House of Rock features a ceiling of about 25 feet and is 20-30 feet wide. 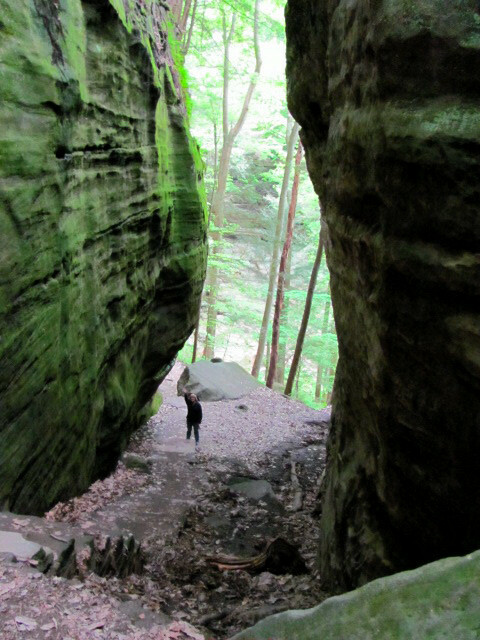 However, this corridor/ cavern within the rock is 200 feet long and open on both ends. Local folklore claim robbers, bootleggers and horse thieves and such would often hide here. Some called it Robbers Roost. Also, in 1835 a 16 room hotel was erected here. There were no signs of that building now! There are various color patterns within the rocks depending on the material used during their formation. 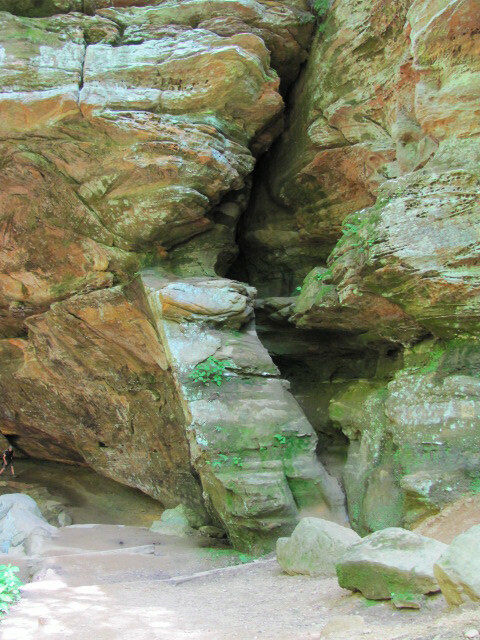 The trail continues past the Rock House to a 150-foot cliff and cave-like conditions. 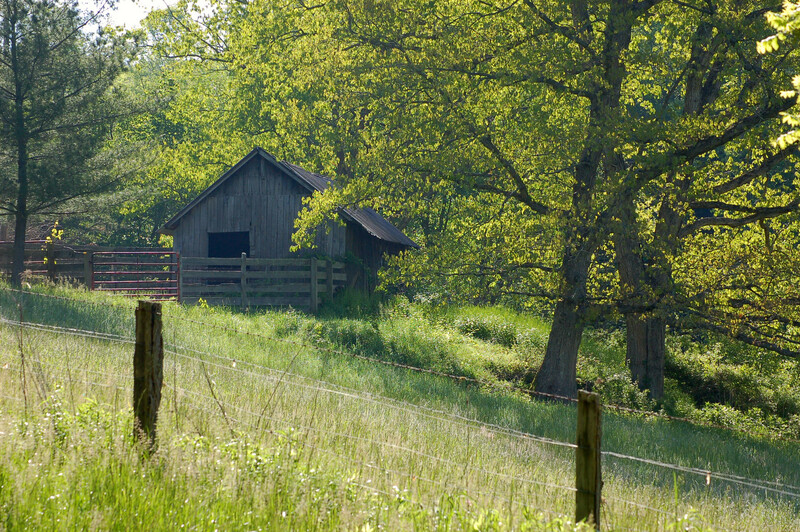 Small barn spotted along way to Conkle’s Hollow. 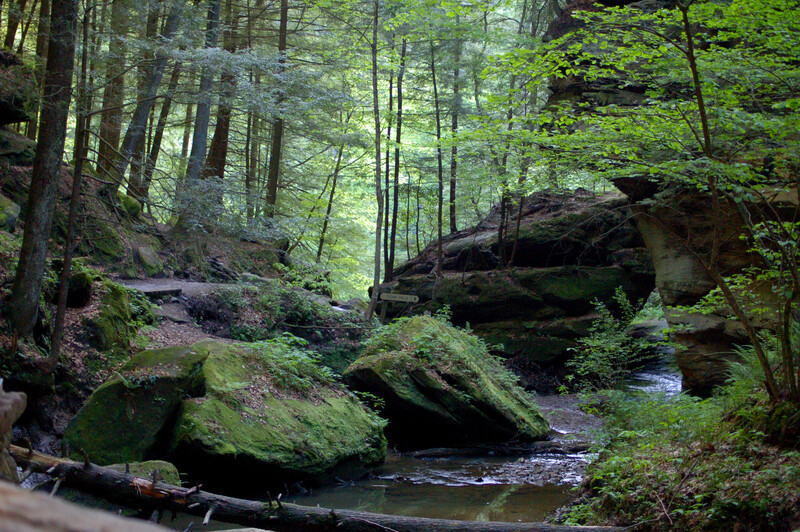 The Conkle’s Hollow area of the Hocking Hills is considered to be one of the deepest gorges in Ohio. 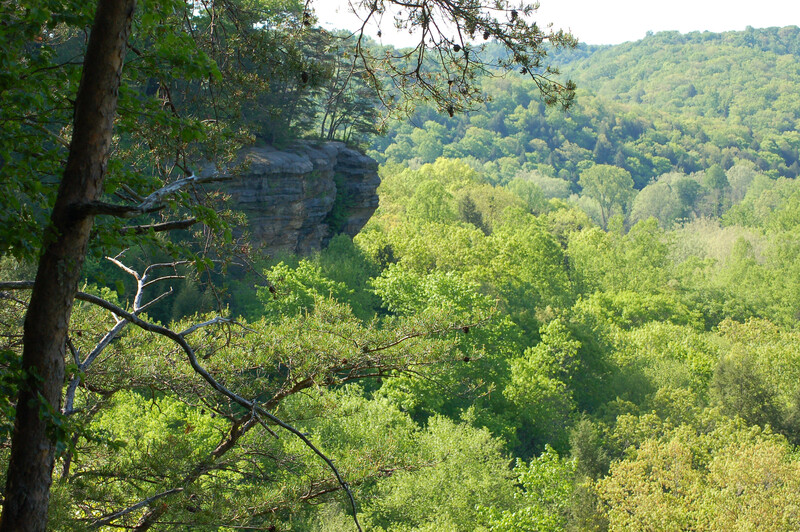 The slopes are rugged and steep with rocky outcrops jutting from high above the gorge’s sides. They are 200 feet high in places. The gorge, itself, is about half a mile long. 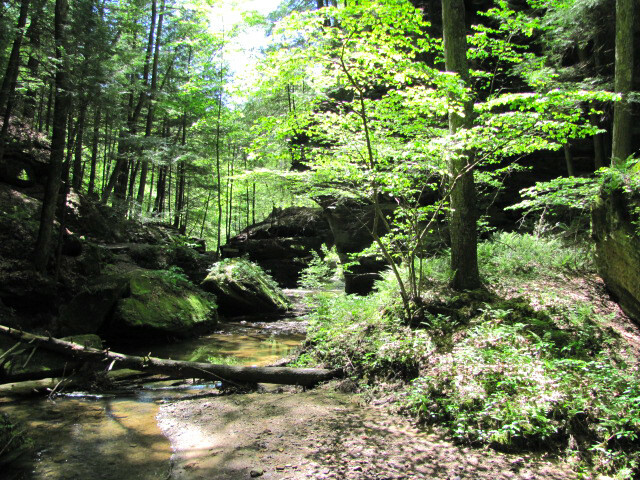 The valley floor is thick with vegetation thus not allowing much sunlight to reach the bottom of the gorge. 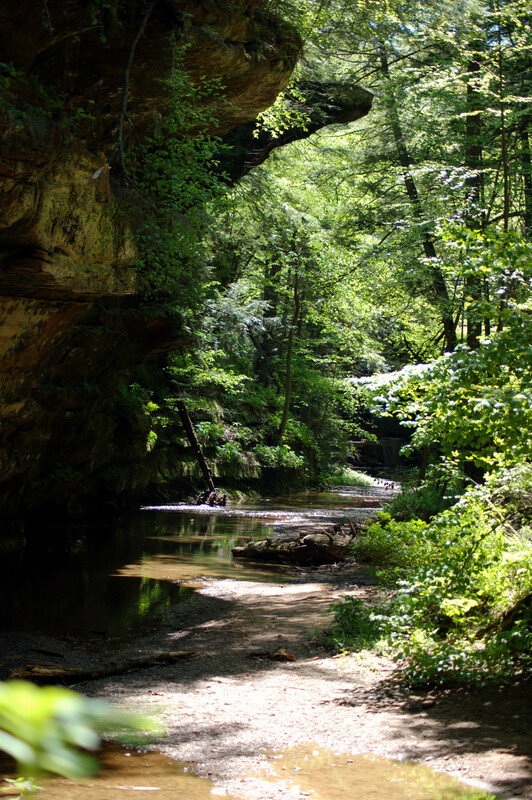 The width between sides at the end of the gorge is only about 300 feet. Laurie and I hiked the rim trail that circles the gorge. 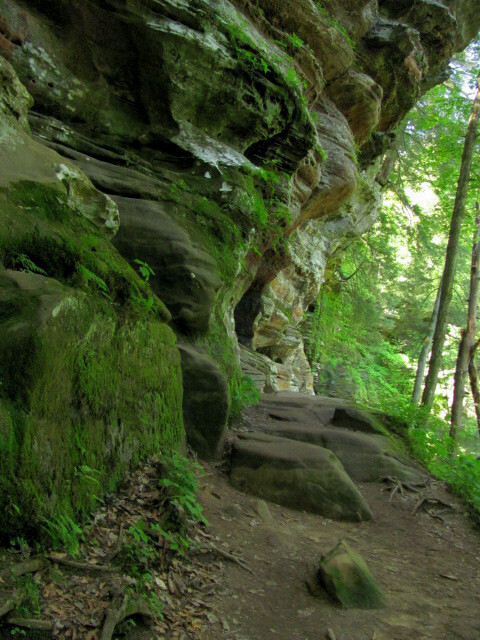 The trail is usually made of smooth, sandy rocks. 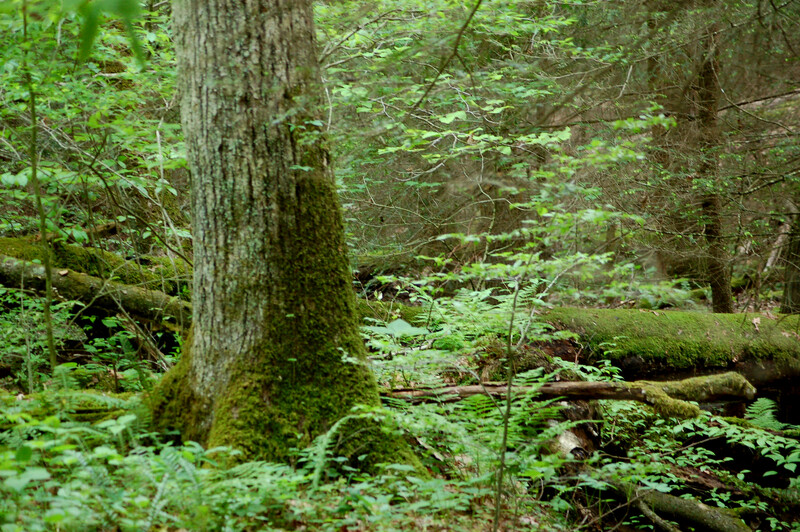 The length of this trail is over two miles. 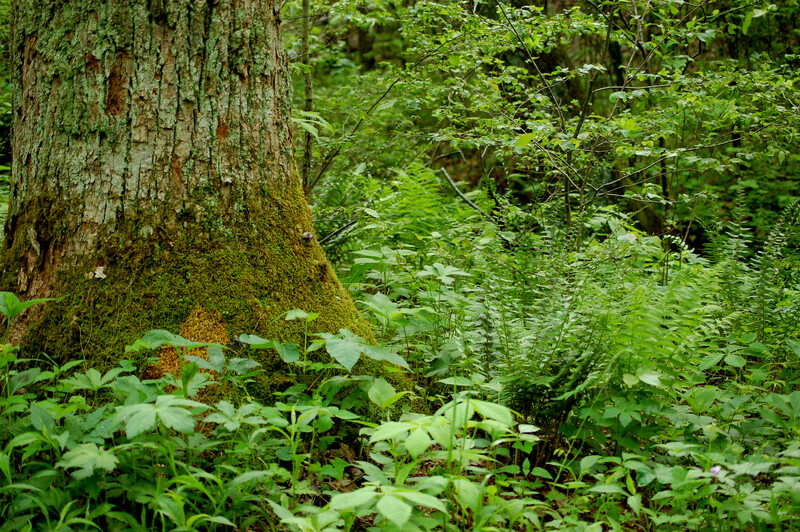 As it states at the trail’s beginning, the hike is potentially dangerous with injuries and even deaths occurring from mishaps or carelessness. One of many breakages within the rocks. 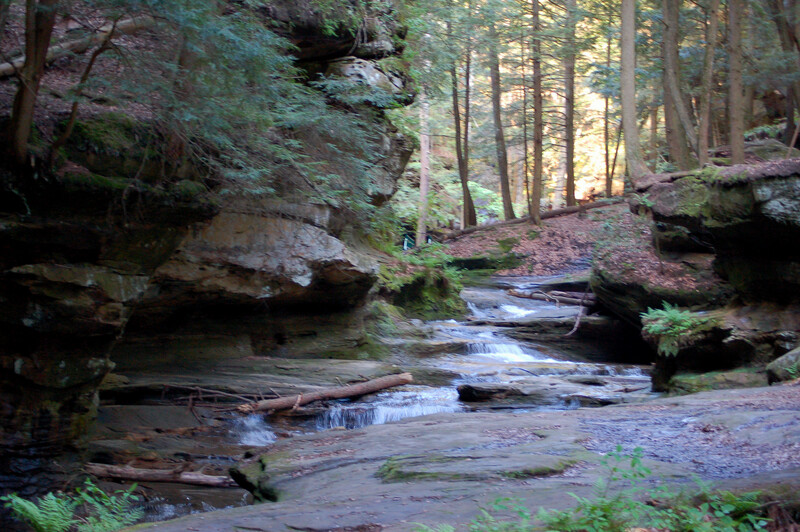 At the gorge’s end a waterfall tricking down over the rim. the rocks are all very high and impressive to behold. Breakages in the rocks in times past are evident and one can study these breakages and see how they once fit to the rocks above. Winter hikes could be even worse with snow and/or ice being on the rocky outcrops. Today was cool and sunny allowing for some photo opportunities. 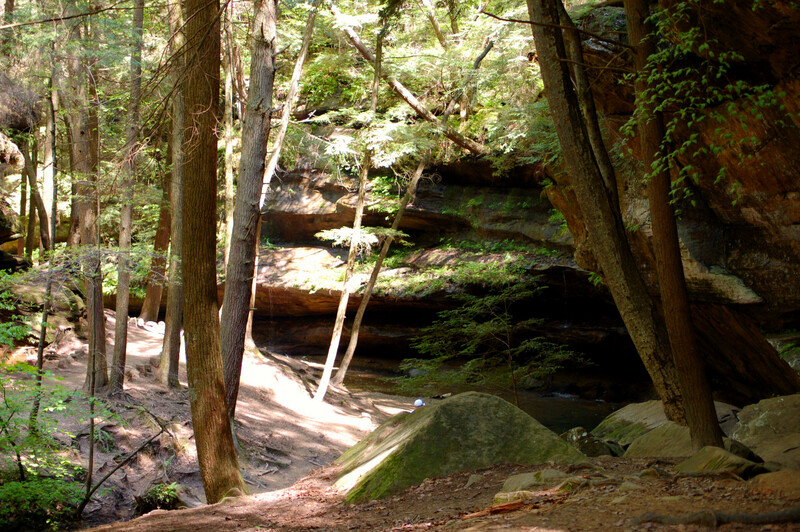 The hollow became known as Conkle Hollow after a name and date was discovered carved onto the rocks. The carving was “W.J.Conkle 1797”. 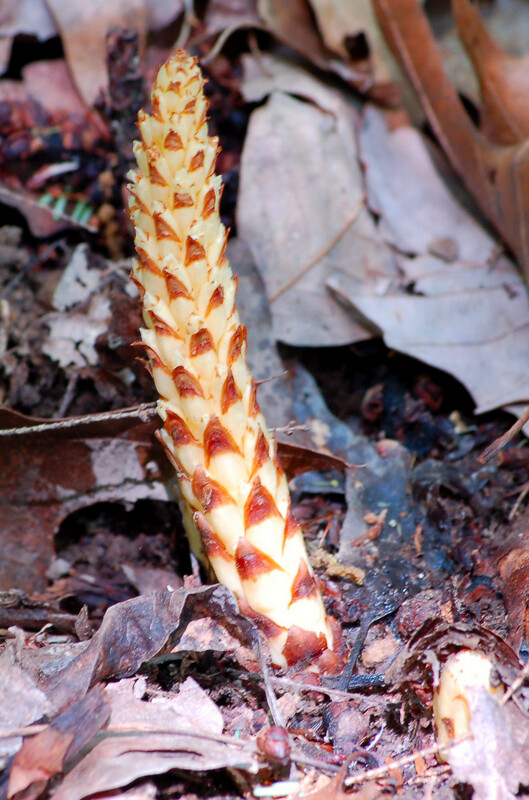 Squawroot, a parasitic plant. It usually grows in clusters. 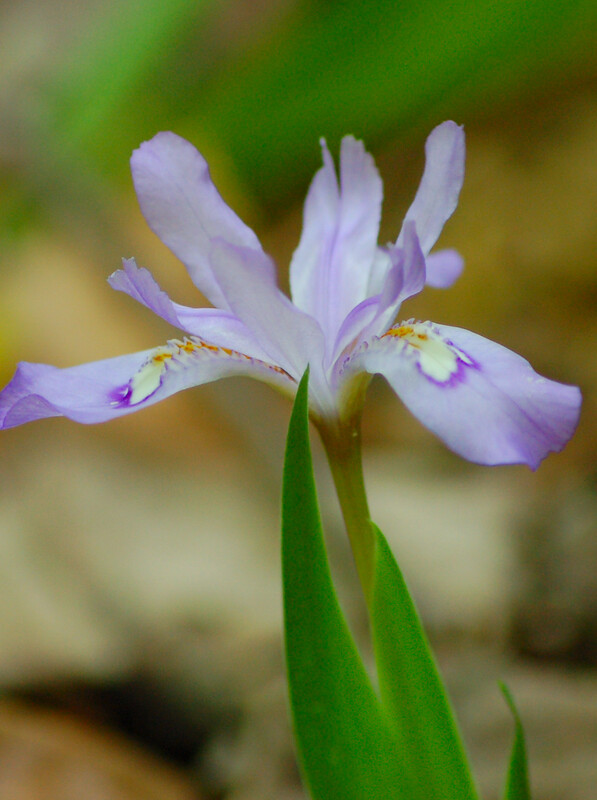 Some areas of our Hocking Hills adventure showed many wildflowers such as trilliums. We, unfortunately, were about two weeks late to witness their beauty for they had completed their annual blossoming time. 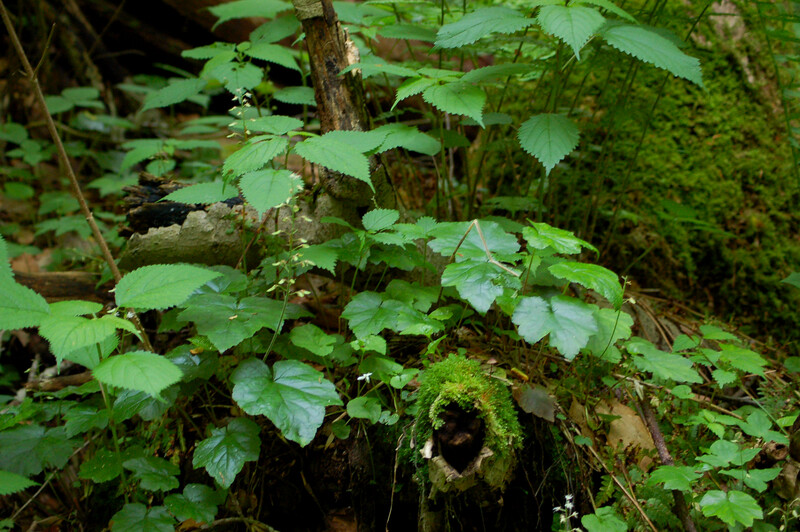 Jack-in-the-Pulpits and Golden Ragworts were in full blossom as were the Wild Geraniums. Turkey vultures were common throughout our hikes and journeys since they like to nest in rocky areas. 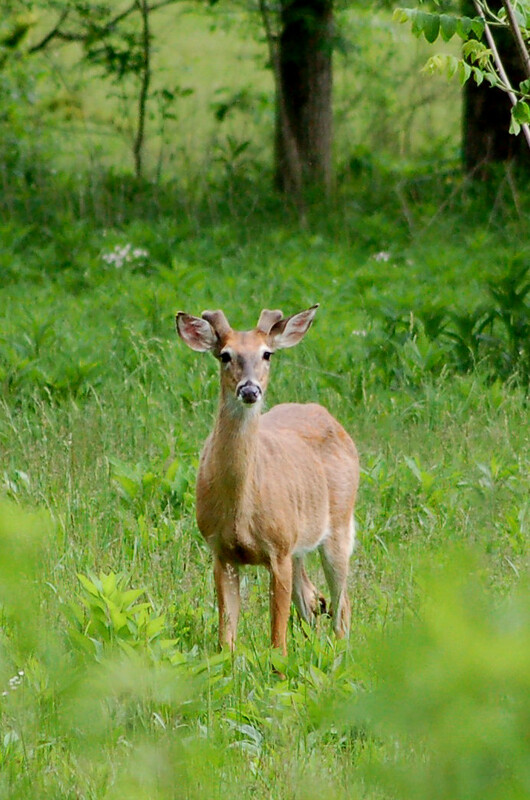 In times past the Shawnee and Wyandot Indians used the areas. 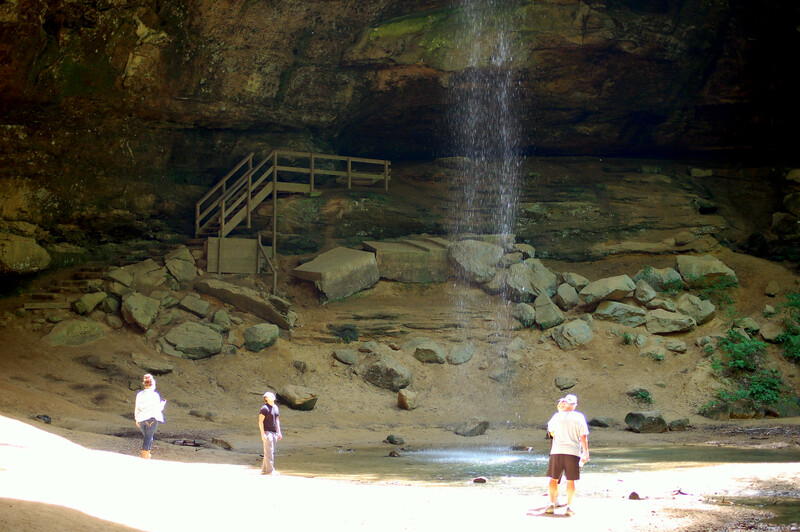 The falls at Ash Cave. The falls with a slower shutter speed. plans last March to visit a place he had been to in the past. 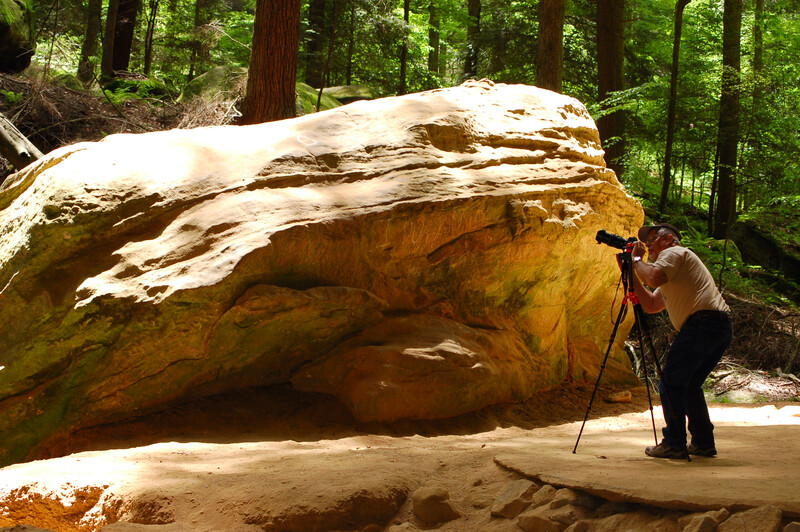 He knew I would have had loved it, so he asked another mutual friend Steve and I to travel and visit Hocking Hills State Park near Logan, Ohio. We tried to schedule this get together for different times and weather or threat of weather caused cancellations. Another time we thought the plans were set and a change in a contractor’s work schedule made for another cancellation. Top of cave where tributary flows. 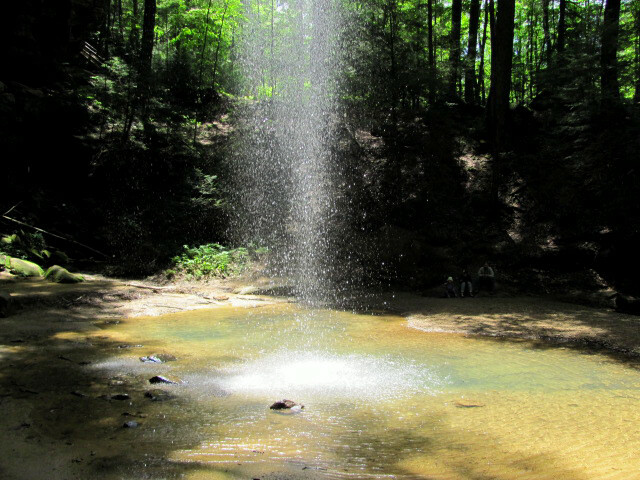 We visited and hiked a number of areas within the park system and the sites were breath-taking to say the least. I will be dividing up my entries here with various areas we explored and hiked. I will include photos with each entry, however be warned the photos can not do the vastness of these sites justice. 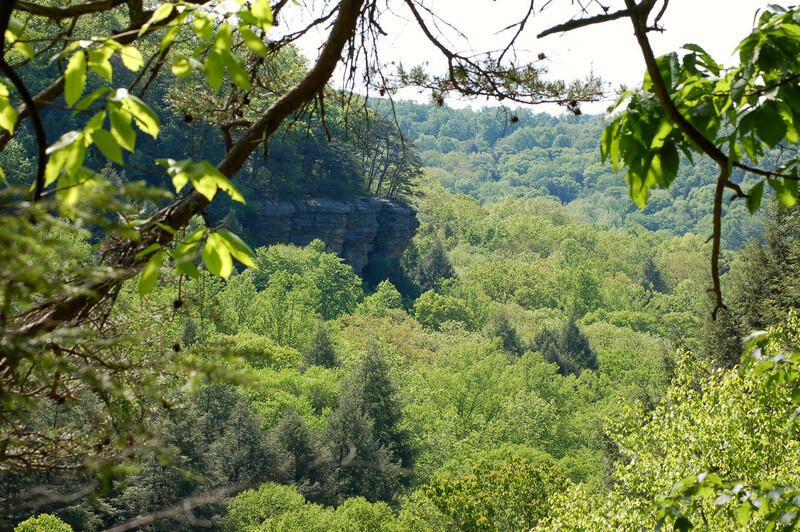 For instance the Ash cave is 700 feet in length. Capturing that magnitude of size with camera can not allow the feelings of awe we witnessed. This cave is spectacular in both size and beauty. 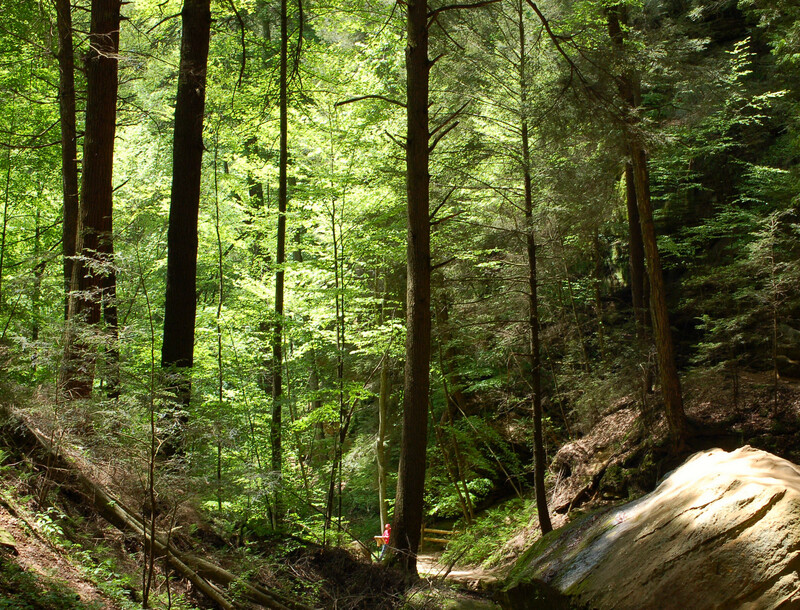 The gorge walking to the cave features massive beech, hemlocks and other trees. 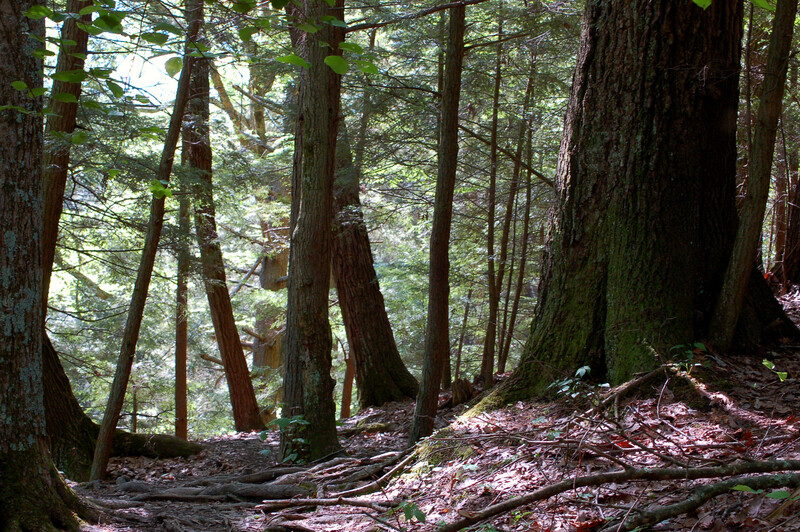 One can compare the trees to the towering trees of Pennsylvania’s Cook Forest. The gorge is about one quarter of a mile in length. 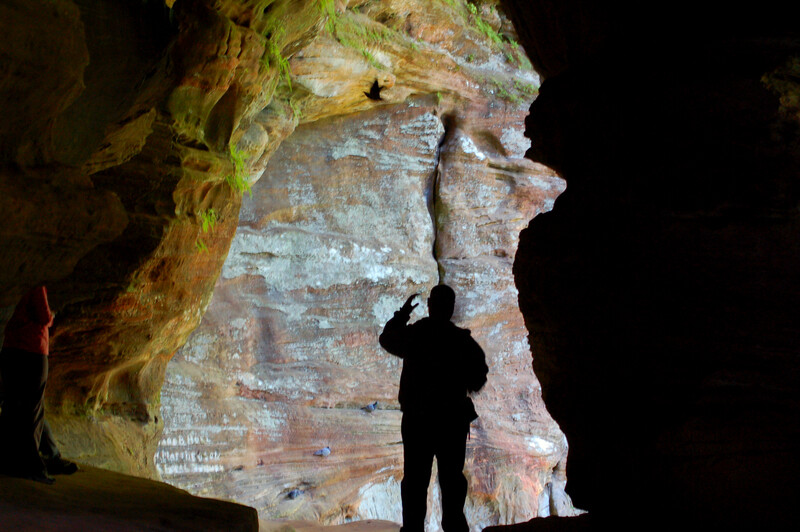 One will find a horseshoe shaped cave at the end of the gorge. As stated above, the length of the cave is 700 feet. The depth at one point is 100 feet. The front rim of the cave rises 90 feet high. Quite an impressive hole indeed! 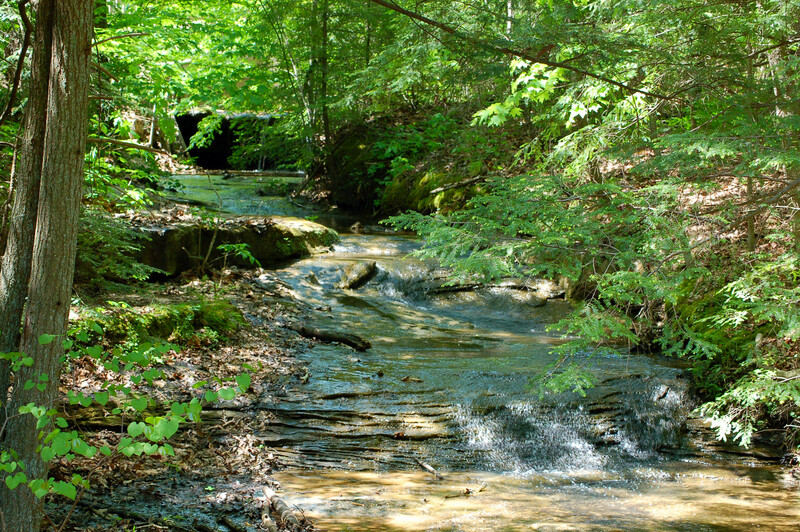 A small tributary to Queer Creek tumbles over the rim of the upper cave. 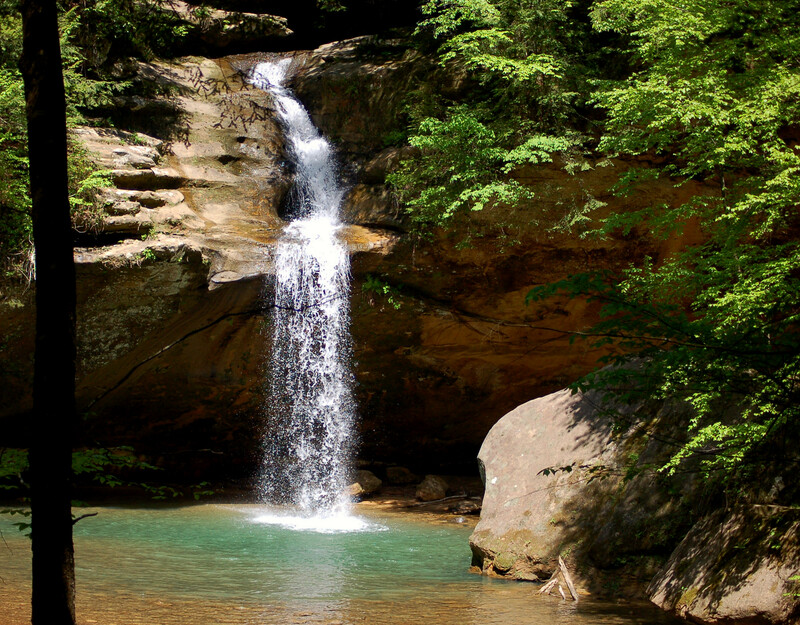 The water falls and forms a beautiful pool before ambling towards the creek. I took many, many photos of both this waterfall and cave. 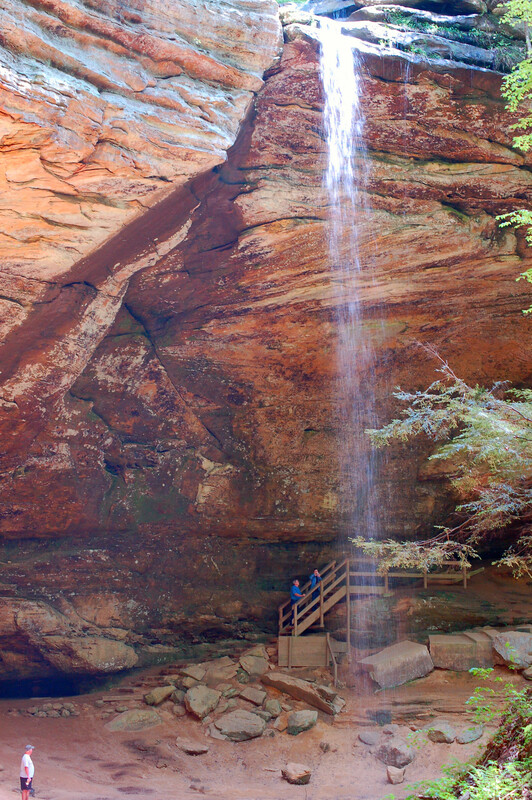 Look closely at some of the photos and you we see people to allow a size comparison of the falls and cave. 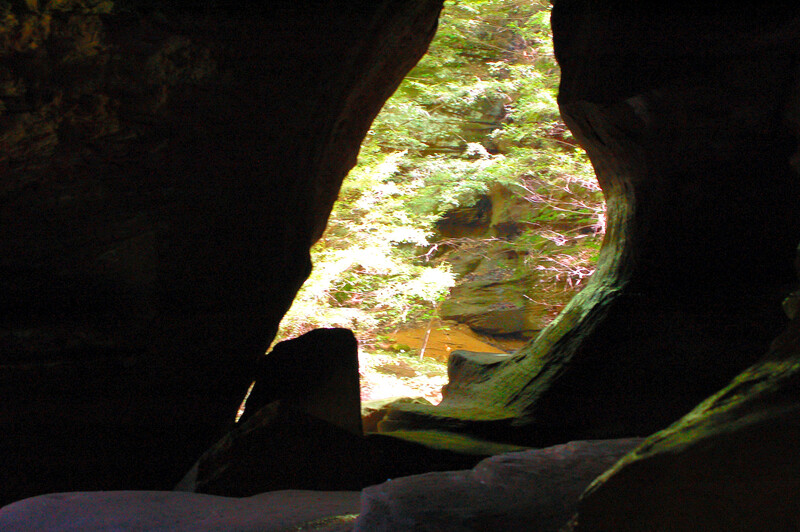 The cave was named after early settlers found much ash under the shelter area of the cave. The ashes were said to be about 100 feet in length and thirty feet wide. The depth was, as much as, three feet! It is believed to have been from Indian activities over a long period of time. 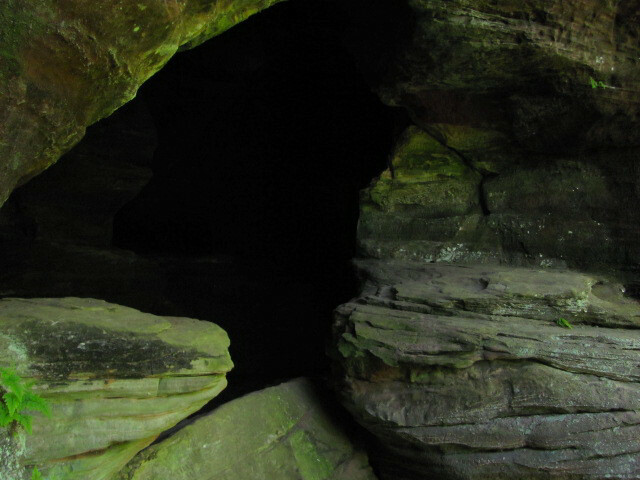 The cave was used as a Christian service site and later township meetings. This lasted until a church was built for the congregation.